When things are going well down at the Deepwater oil spill site in the Gulf there are press conferences, data flows in a timely manner and the public can understand what is going on. When there are problems, these get delayed. Then as I noted yesterday we become dependant on the videos that BP release, to get a closer and more immediate view of the actual situation. That can at least show the occasional something significant. 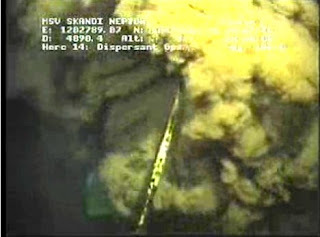 Today’s such topic is the picture of the well from the Skandi ROV that I took at around 6:15 pm. (though Admiral Allen also had something interesting to note, which I will point to at the end of the post.) And in an update there was a leak on the choke line, so a part (the yellow pipe below) has been removed for repair - the "as is" shot is at the end of the post. UPDATE The part was repaired and replaced, and at 3:37 pm with the choke line closed, oil stopped flowing from the well into the Gulf. down below two rams there’s a what we call our flow T and there’s two sides to it and that’s where the flow would be coming out when we actually shut one of the rams. As you may note from the picture the flow has now switched from the top drill pipe section to the two ports below the rams. We can thus presume that the well integrity test is now underway. The two separate flows from the two ports can be discerned still. The second review that was going on was our team of scientists and industry experts who were once again looking at all the analysis and the procedures – the test procedures that were put in place to make sure that the test was absolutely designed to maximize what we would learn from it and minimize any risk under all possible scenarios. And this test is so important that a decision was taken to give them another 24 hours to make sure that this was the best possible test procedure we could execute. It was just felt that this is so important we wanted to make sure that there was no questions in any minds that we would learn the most from this and we’d minimize risk and so that was the decision that was taken yesterday. For which, I expect, you can read that Secretary Chu, and his visiting team had a set of questions and discussion points that had to be gone over and reviewed with them, to ensure that they were happy, and would therefore give their thoughtfully considered blessings. They were supposed to have everything settled by the afternoon press conference. The plan is that at midday today, the team will get back together and a decision will be (maken) – be taken on the path forward. If any amendments need to be made to the test they’ll be made at that point and I’ll certainly let you know at our 2:30 meeting where we stand on that and the path forward. But what we don’t want to do is move forward with a test that ends up with inconclusive results. And so that’s what the 24 hours is about. We just need to make sure that there’s absolute clarity on this is the right test, this will give us the most information, this will minimize the risk and we can proceed forward and as a result of that then know the best path forward after that, whether it’s to shut in the well, whether it’s to go to containment, what does it mean for the kill with the relief wells. All of those things. We just need to make sure that this is right not – as much as we want to do things as soon as possible, we also want to make sure that they’re done absolutely correct. But problems apparently persisted as became more obvious this afternoon, as the time for the start of the integrity test (and the explanatory press conference) kept getting put back later and later, until it reached 5 pm when apparently the decision was reached. That transcript is not out yet, but the result was evident with the change in the path of the oil through the stack. There are presently 3 ROVs monitoring the flow (the 2 Skandi ROVs and the BOA ROV 2) and over the course of time the flow out of the ports has changed from the relatively small flow shown above to higher volume flows, and back. 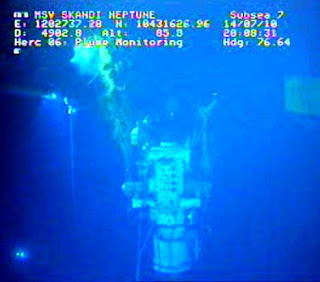 Skandi ROV view showing the higher flow levels from the ports – this is the ROV that is issuing the dispersant in 3 jets from the wand in the picture, at lower flow rates those jets are visible. The third ROV, the BOA one has moved around so that the lack of flow from the drill pipe is confirmed when the pipe is back-lit from the Skandi ROV that took the first shots above. I mean the one thing that – and of course I can’t predict exactly how the ROV cameras will be set up but what we will be doing is on the capping stack, we will be opening the two side vents and so there will be – instead of flow just coming out the top, there will be – you’ll start to see flow coming out of the two side vents and then the top gets closed and then one side vent gets closed and then over a period of about a couple hours we close the other choke mechanism. So that would indicate when – that the test has started when we’re shutting down that third event. Whether you’ll get to see all that and figure that, I don’t know. But we’re committed to keeping you posted on where we’re going. 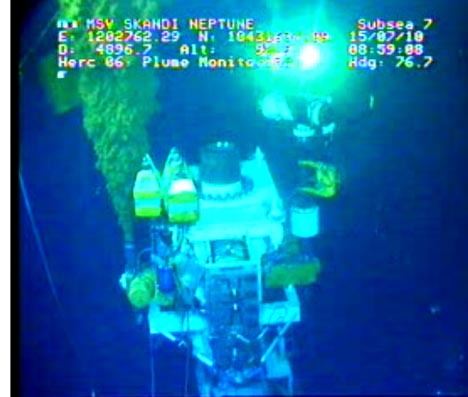 Well the shut-off and diversion of the flow is documented in the pictures above, though it hasn’t been possible to show the switching of the flows, unless this was where the volumes coming from the well and shown by the Skandi ROV changed. The – in terms of the risk, this is all about as we shut in the pressures, what do the pressures mean. Where – like I say, we don’t know – if we can’t build up pressure, where does that mean the pressure’s being relieved and it can be everything from down very deep to shallower and it was really about trying to understand what do the pressures over time mean, where does that mean the pressures being relieved and it’s one thing to have pressure being relieved deep down. It’s a more difficult situation as it’s being relieved shallow and that’s what we’re just looking at is what do all the pressures mean to make sure we understand exactly what’s going on. And I think I’ve talked about that before, what we want to do is avoid that oil’s being put out in the shallow environment and then there’s always the potential is motive that might be that it could breach up to the surface. We consulted extensively with outside experts from academia. Our science team, led by Secretary of Energy Chu, consulted also with other members of industry regarding of potential issues we should definitely deal with. I will zero right in on what the discussion was mainly about and I’ll be happy to answer some questions about it. We have never been sanguine or sure that we have known the condition of the wellbore and the casing pipe since the event occurred. As we've gotten closer to having the potential to close in and do pressure readings on the capping stack, we have had numerous discussions about what the current status is of the wellbore and the casing and the implications if they had been damaged or if there was any communication outside the wellbore that might bring oil or hydro carbons into what we call the geological formation potentially to the – to the sub-sea floor. Some – some questions were raised yesterday about the implications of leakage and how that interfaced with the test as we start to shut down the valves and increase pressure in the capping stack and I'll go over that process in a minute. What we might expect, what we’re – even low probability, high consequence outcomes. As a result of that, we asked BP to go back and give us some more information on the structural strength of certain portions of the casing pipes. They had run down there particularly around the 22-inch and 18-inch casing pipes. We asked for some more information about assumptions that could lead to irreversible leakage outside the well from external experts. And we thought about what kind of thresholds we would need to look at as we ran the well integrity test. That took us about 24 hours to work through all of that. We've had a number of conversations. And early this afternoon, I briefed the president and members of the cabinet on the way forward and at this time will be releasing an order to BP to proceed with the well integrity test, but we gave them some additional direction and we did this to make sure that we were taking due care, and in some cases maybe an over abundance of caution to make sure that we didn't do any irreversible harm to the wellbore as we proceed forward. Ho noted that the test is being run in 6-hour increments, so that if they started at 17:00 Central, then the second stage should start at 23:00 Central. (about 10 minutes from now as I write). Here’s how we intend to do the well integrity test. We will slowly take down production from the Q4000 and the helix producer later on today to the point where they are not producing anymore. That will force the oil up through the blowout preventer into the capping stack. At that point, the kill line, the choke line, and the top of the stack will be open, and there’ll be product releasing from there and we know that that's the reason we’ve got the skimmers and the additional capacity on the surface to deal with that. We will then in sequence close the middle ram here, which will stop the flow out of the top of the stack and then we will take pressure readings. We will then close the kill line and take pressure readings. 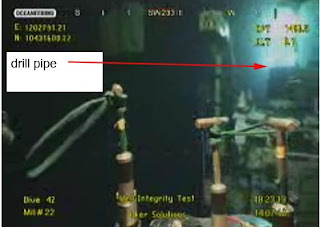 Following that, we will use a remotely operated vehicle that will hook on to the – that – the little bar here that actually turns a valve, and this choke line has been especially constructed – if you looked at the video, you'll see kind of a yellow object up there with a curved up pipe. That is the choke line. That is the last way for oil to leave the capping stack. We will slowly close that, very, very slowly, in partial turns, and measure pressure at the same time. In that manner, we will slowly close the entire capping stack and start the reading pressure. Now, as we do that, we're going to be watching very closely the pressure readings. 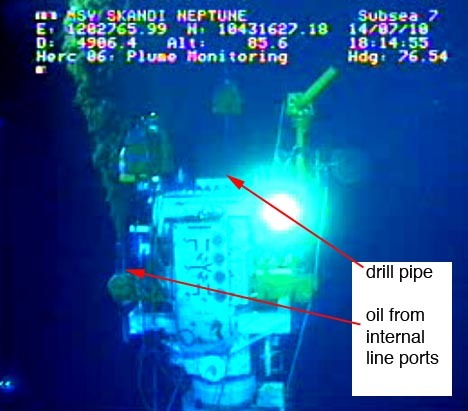 If the pressure readings stay low, that will tell us that the oil is probably going someplace else and we need to consider the fact we may have a breach in the well bore or in one of the – in one of the casings. If that is the case and we have very low pressure readings for about three hours, we will probably stop at that point. That will be the assumption and we will go into production, bring everything back online so we minimize the amount of oil that's going into the environment and we will assess the results of that test. At the end of 48 hours, we will stop the test, assess all the information we have. We will probably do another seismic run over the area around the well to detect any potential hydrocarbon or methane leaks from the sea floor. And then we will assess whether or not we need to go into another cycle of closing the capping stack down, taking pressure readings, and this will lead us possibly to two very positive directions. Number one, at some point our ability to determine that we can, with confidence, shut the well in and understand we're not harming the well bore and the casings. There’s a seismic test that was done yesterday and we do not have those results until this morning. And what they did was to reinforce the fact there was not a problem where there could have been. And so we had more confidence in the way we’re looking at the alternatives that’s come about. Tell you what – why we’ve been obsessing over this, and (probably) I should have explained a little bit more on the front. We tried the top kill back in May, and we pumped a lot of mud into that well, and as long as we were pumping mud into the well, we were suppressing the oil. But the maximum pressure we were able to achieve pumping the mud down the well bore was only around 6,000 (GSI), so the question is why aren’t we able to achieve a greater pressure head and be successful with the top kill? And you can postulate a number of things, but two we’re discussing, and this was part of the discussion over the last couple of days. One of them we’re just (pointing) out to the top of the blowout preventer, like we saw the oil escaping. And there was a lot of mud (inaudible) there. The other one was that as it was being forced down, it might be escaping the (as it reached) the casing through the well bore. We don’t know that. The (admission of something) was potentially wrong and we should have this discussion partially due to the fact that we’ve never been comfortable with what the 6,000 psi meant during the top kill effort and what the implication for not being able to achieve a higher pressure. Now if they couldn’t get the pressure above 6,000 psi then that may be indicative that they were injecting more fluid somewhere in the well, since the reservoir pressure is 11,900 psi. On the other hand if the well stopped the oil flow (which he says it did) then you have to get into how much mud they were able to drive down the column to determine whether they have a problem or not. It will be interesting to see what the transcript for tomorrow morning's brief brings. /\ can anyone read Chinese?